The public debate about the best way to reduce the level of government debt highlights our difficult situation: Our wants greatly exceed our ability to pay for them. In the case of government, purchases require current revenue through taxation or borrowing; the fiscal cliff arose from a level of debt caused by wanting more (and purchasing more) than we can pay for. If we wish to reduce debt, we must make difficult choices. One choice is to cut government spending on goods and services—but which spending priorities should be cut? The other choice is to raise taxes—but who should pay more? You might prefer one choice or the other or a combination of both. In fact, you may have very similar thoughts about your personal or family budget. These issues are based on understanding the economic concepts of scarcity and opportunity cost. Let's use a specific example to get a better grasp of these ideas. Suppose you receive a $20 gift card during the holidays. The $20 limit acts like a budget that constrains your spending. In other words, your resources are limited. How about your wants? Are they limited? If you are like most people, they are not—you would like to have much more than you can afford. This condition of limited resources and unlimited wants is called scarcity. The $20 limit means that you can't have all the CDs, movies, or games you want; you must choose the one you want the most. Deciding between the recently released CD from your favorite band and the newest hit movie requires a choice, which involves an opportunity cost —the value of the next-best alternative when a decision is made. The opportunity cost is what is given up. So, choosing the CD from your favorite band means giving up the movie. People make such decisions all the time. Managing a family budget is also an exercise in managing scarcity and opportunity costs. Household income determines the amount of money a family has to spend; that is, it constrains spending. And, unlike our gift card example, household wants are not limited to CDs, movies, and games. Rather, they include basics such as housing, medical care, education, food, and clothing. But, just like the gift card example, because our wants exceed our ability to spend, we must make choices, which involve opportunity costs. So, more money spent by a family on food might require less spent on clothing. Credit cards and other forms of credit make it possible (and quite tempting) to exceed spending limits. Does debt negate scarcity? Does it permit you to buy more than your income would allow? It might seem so, but you still have a limit. Using debt means that you are borrowing your future income to buy goods today. As you repay the debt (plus interest) over time, you will have less income in the future to buy goods and services then. And remember that credit cards have limits, and lenders avoid lending beyond the borrower's ability to repay the loan. 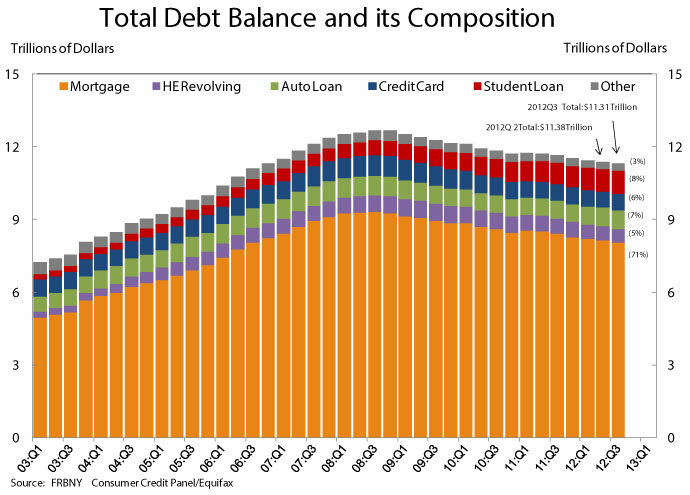 At the end of the third quarter of 2012 (August 31), total consumer debt stood at $11.31 trillion (see first chart). NOTE: The total level of household debt has decreased since 2008. While mortgages still represent the largest portion of household debt at $8.03 trillion, the level has been falling. Outstanding student loan balances have been growing and currently stand at $956 billion. HE, home equity. SOURCE: Federal Reserve Bank of New York Credit Panel/Equifax: http://www.newyorkfed.org/research/national_economy/householdcredit/DistrictReport_Q32012.pdf. In many ways, the government faces these same choices. Citizens have collective wants and the government attempts to satisfy these wants through its spending. Social Security, health care programs such as Medicare and Medicaid, and national defense are among the top federal spending categories. But the ability to satisfy our society's wants is constrained by the level of government income, which is generated primarily by taxing workers and companies. Just like individuals who make spending choices, when the government chooses, there is an opportunity cost. If more money is spent on national security, the result might be less spending on health care. It is possible to raise taxes to provide additional income for the government to allocate, but that imposes further budget constraints on workers and companies who pay taxes—so, this policy choice also has opportunity costs. Of course, the government's spending is not limited to tax revenue. Just as families can, the government can use debt to pay for some of its goods and services. At the end of the third quarter of 2012 (August 31), total federal debt stood at $16.07 trillion (see second chart). NOTE: The total federal debt stood at$16.07 trillion at the end of the third quarter of 2012 (August 31); see http://research.stlouisfed.org/fred2/series/GFDEBT... For an up-do-date view of the federal debt, see the U.S. Treasury's "The Debt to the Penny and Who Holds It:" http://www.treasurydirect.gov/NP/BPDLogin?_application=np. SOURCE: Federal Reserve Bank of St. Louis FRED database. What is the downside of government debt? Using debt to buy goods and services today means the government is borrowing future income (that is, tax revenue)—which means less income in the future for buying goods and services then. In addition, there is a limit to how much credit lenders (or investors) will extend to a country; they will avoid lending beyond the government's ability or willingness to repay the loan or will do so only at very high interest rates. An understanding of scarcity and opportunity cost is crucial to making good economic decisions. Remember that scarcity describes the condition in which our wants exceed the resources necessary to satisfy those wants. Scarcity requires us to make choices and choosing involves an opportunity cost—the value of the item given up when a choice is made. So, making wise (and sometimes difficult) choices requires considering the opportunity costs. © 2013, Federal Reserve Bank of St. Louis. The views expressed are those of the author(s) and do not necessarily reflect official positions of the Federal Reserve Bank of St. Louis or the Federal Reserve System. Government debt: The sum of accumulated budget deficits. Also known as national debt. Scarcity: The condition that exists because there are not enough resources to produce everyone's wants.